ST. FRANCISVILLE, La. 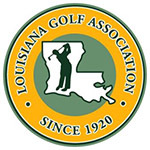 (Sept. 16, 2018) – First-round leaders Bart Dornier and Ken Buchan held off the rest of the field Sunday to capture the Louisiana Golf Association’s Senior Four-Ball Championship. Dornier and Buchan had a slim one-shot lead over three other teams entering the final round at the Bluffs on Thompson Creek. They caught fire on the last nine holes Sunday to take the title by four shots over three other teams. Both Dornier and Buchan parred the first two holes before Buchan made the team’s first and only birdie on the front side on the par-4 third. It allowed the team to make the turn with 1-under 34. Buchan got hot on the back nine with birdies on Nos. 10, 12, and 14 before they both birdied the long par-5 18th alongside Thompson Creek to finish with a 4-under 32 on the back for a 5-under 66 and a two-day total of 11-under 131. Three teams tied for second place including Mike Hymel/Ronnie Averett, Randy Goff /Steven Inzenga and Bill Land/Eric Lavespere. Each side finished at 7-under 135. Bob McCusker and Scott Haynie rounded out the top 5 at 6-under 136. The tournament also included a super senior division for players 65 years and older. Henry Cole and Wayne Peddy of defended their 2017 title by topping Mickey McDonald and Harold on the second playoff hole when Peddy ran in a 30 foot putt for birdie. Both teams finished regulation at 5-under 137. Corky Yates and Frank Brame were another shot back in third. Limited to the first 80 team entries. Championship to be conducted over 36 holes. Entrants must be 50 years of age. Super Senior Championship will also be conducted concurrently for participants who are 65 years of age and older. Entries are open to any Louisiana resident (as of at least 90 days prior to the Championship) who is an amateur golfer (as defined by the USGA) holding membership in a LGA member club in good standing.